And if so, what can you do about it? For many, prepping has been a mission and a passion for many years. It all starts innocently enough. We are bit by the prepping bug and typically start storing some extra water, food, flashlights and batteries in response to a widely publicized natural disaster. Soon we move on to first aid supplies, home defense systems and bug-out-bags. And it goes on from there. Somewhere along the way, prepping takes over our lives and becomes a significant lifestyle shift. Our spare time is spent planning for the BIG EVENT, be it a natural, man-made or even a politically motivated apocalypse. We have read the books, watched the DVDs, compiled resource manuals, and purchased gear. And still we are compelled to do more. And so I ask: Is being prepared an addiction, an obsession, or a chore? Can we call it quits if we had to? Do we know when enough is enough? Or are we hoarding? And what is the difference between prepping and hoarding? These are tough questions which we each must answer for ourselves. To get you started, let me offer up some definitions so that you can begin to formulate a response and arrive at some personal conclusions. Obsession: a compulsive or persistent preoccupation, idea, or feeling. Chore: a routine or minor duty or task. Hoarding: a supply or accumulation that is hidden or carefully guarded for preservation or future use. Perception often blends with reality so what I say next needs to be taken within that context. In my own household, it seems as though every spare moment is spent learning or doing something related to preparedness. When we shop, foremost in our mind is “would this work if the SHTF?”. We learn new skills and revisit old ones so that we stay current and up-to-date with our survival skills. We garden because we feel we have to and not simply for the joy of it. Even as we consider moving to a different home, the punch list of must-haves is dictated by the need for isolation, storage facilities for three years worth of food, and a place to raise chickens and goats. This business of prepping can be utterly exhausting! And not only that, with extra money being directed toward the purchase of prepping supplies and gear, the budget often gets stretched to the point were a non-prep related purchase becomes a gut-wrenching exercise in guilt. This is not an isolated phenomena. The like-minded people I pal around with feel the same way. With a life that was busy to begin with, the additional time and energy taken up with prepping activities takes precious hours away from the rest of our lives. A breaking point is reached and without realizing what has happened, prepping becomes work. How do you feel? 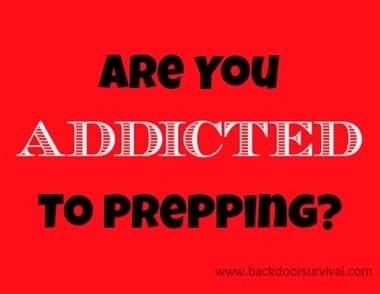 Has prepping taken over your life to the exclusion of everything else? Do you feel you have balance in your every day activities? Or not so much? Do you have more than enough time to do what you want to do? Do you spend quality time with the people who matter to you? Do you have at least one hobby or pastime outside of your work, family and prepping activities? What have you done for fun and entertainment lately? Do you treat yourself to something special at least once a month? What is that? Do you sleep well and do you look forward to getting up every day? When is the last time you spent a day doing nothing more productive that watch a DVD or read a book? When is the last time you ate a meal at a table, without the television or other distraction? Do you have something to look forward to such as a vacation or special event? I hope that you will take the time to ask these questions of yourself, for in spite of the dire outlook for our country and our planet, we still need to get on with this business of life. What we perceive as a bubble in time may go on for decades and, depending on your age, a lifetime. Be content with the knowledge that you have prepared to the best of your ability and then move on and move forward. Embrace the life experience now. Do not wait for some undetermined time in the future to have some fun, to relax, and to savor just being alive. That future, if the SHTF, may never come. Take the cure from prepper addiction and prepper obsession. Continue to prep but recognize and accept it for what it is and move on to include other things in your life. Go out for an occasional movie. Have a few beers with friends. Shut down the computer for a day or two and share some special time with your sweetie. But most of all, be balanced, be happy and go for the gusto. Being prepared can be a chore, yes. But it can also be a chore with a happy ending. If you have not done so already, please be sure to like Facebook which is updated every time there is an awesome new article, news byte, or link to a free survival, prepping or homesteading book on Amazon. You can also follow Backdoor Survival on Twitter, Pinterest, and Google+ and purchase my book, The Prepper’s Guide to Food Storage from Amazon. Wheat berries are a pantry must-have and are extremely versatile when it comes to using them in recipes. Although they can be ground to make delicious wheat bread, they can also be added to soups and hearty dishes as well as made into a delicious warm cereal. Wheat berries are a true whole grain, full of vitamins and fiber and have a sweet, nutty flavor with a delightful chewy texture. 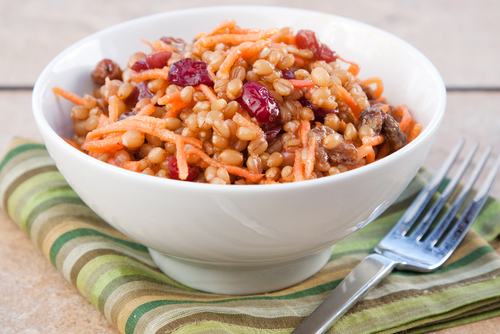 Soak ‘Em – Wheat berries can take 50 minutes to an hour to cook on the stovetop. A trick to expediting the cooking process as well as making wheat berries tender and chewy is to soak them overnight to speed up the cooking time. Toast ‘Em - Toasting the berries for a few minutes before cooking encourages their nutty flavor to come out. Spread them out on a sheet pan and toast in a preheated 375°F oven for about 10 minutes, just until they brown a little. This is an optional step, but really brings the flavor of the wheat berry out. Get Creative – Because of the versatility of this grain, you can use them for virtually anything. Play around the spices, adding fruits and vegetables or adding them to other dishes. Here is one of my favorite cereal dishes I made with wheat berries. I’ve played around with different fruits. I love adding 1/4 cup pomegranate seeds, but since we don’t always have this around, I improvise. Enjoy! In a small bowl, whisk together ingredients for dressing. Pour the dressing over the salad and gently toss. Refrigerate the dressed salad to allow the flavors to meld before serving. Serve it cold or heat it up for a breakfast cereal. Ask Tess: What do I do with all of these wheat berries? I do not really know who started the mantra of one is none, two is one rule of survival and preparedness planning, but it is a great notion to cling to. For instance, if you are hiking alone in the woods and you lose your compass, you are screwed. I know, some will say “but I use a GPS, those are almost impossible to lose”. Maybe so, but suppose the battery goes dead? Do you see my point? If you only have one of an essential item, and you lose it or it breaks, then what? The same goes for any other tool or bit of supply you may need in your survival plan. I remember a couple of years ago I was opening a can for supper, and the can opener fell apart after a couple of cranks of the handle. I had another can opener in the drawer, and luck had nothing to do with it, so it was no big deal. However, if I had no backup tool in waiting, I would not have been able to simply grab the back up and finish preparing the meal. I would have had to do without, compromise, or get primitive and open the can with a huge knife. That would have been a pity as the blade would have needed substantial attention after slicing through the metal can. One is none, two is one. It is a good rule to follow and should be a central consideration as you develop your preparedness and survival plans. One drawback to this goal of having at least two of your essentials on hand is the added cost. You have to plan on double the cost of these essentials, thus doubling the size of your preparedness budget as it relates to these essential items. Is it really necessary that we have two or more of everything? Not really. There are times when we can get away with making concessions. We may be able to come up with alternative tools or devices to compensate for the loss of some of our needs. One suggestion I can give here is to make sure that you keep these extra tools in a separate place. Have an extra box of additional tools, but keep it close enough that you can access it when the need arises. Unfortunately, far too many people utilize offsite storage for the excess baggage we consider as needs today. Personally, I consider offsite storage a waste of resources. The money that you spend on locker rental fees could be better used for buying the things you need to develop your preparations for the coming times. The fees for these lockers can be pretty hefty, and in some cases may be enough to equal the cost of a good supply of long-term storage foods. A one hundred dollar a month rental fee equals 1200 dollars a year. How often have you seen food deals for several months worth of food for that price? Just this week, I received a flyer from a mail order house offering a six-month lunch and dinner supply for one at only $1,299.00. That is not a bad deal, and you could afford it if you can afford to pay that much for a storage locker full of household goods that you do not use. If you do use this arrangement, perhaps you need to include this aspect of your life in your overall preparedness plan. Seriously consider what you are paying storage fees for, and decide whether it really makes sense. Granted, there will be instances where there is no other option, but for the most part, much of what we have stored in these lockers have little real survival value. If the crap hits the fan and you become forced to shelter in place, will this locker be of any benefit to you? If you have to pack up the bug out vehicle and get out of town, what happens to the stuff you have paid all that money for in storage? I know some people who have a rental unit as their central bug out command post, with a vehicle inside it ready to roll at a moment’s notice. They keep the truck and trailer fully loaded with MRE’s and long term storage food, along with all the tools they will need to survive if they have to leave town in an emergency. This is a good plan, and, providing you can afford it, and the unit is accessible 24-7, go for it. but it takes a certain level of ability as well as acceptance of the facts to be able to comfortably commit to these sorts of resources. Whatever you decide to do, make certain that you are comfortable with your choices, that can afford your choices, and that you have considered all aspects relating to that choice. $1,299.00 for food for one may sound like a lot of money, but the reality is that it works out to only $216.50 per person per month, for two meals a day. A little over three bucks a meal. When was the last time you had a nutritious meal for that kind of price? It costs an average of eight bucks for a burger, fries and a drink in most fast food places today. 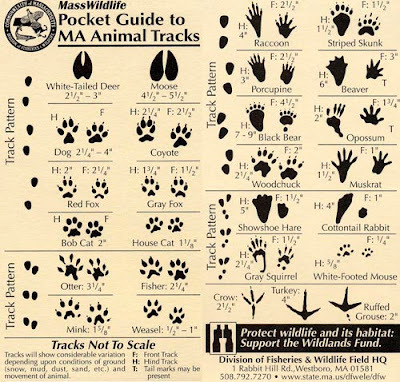 Identifying animal tracks is an important skill for the trapper, and a handy guide like this can be a big help if you are new to trapping. 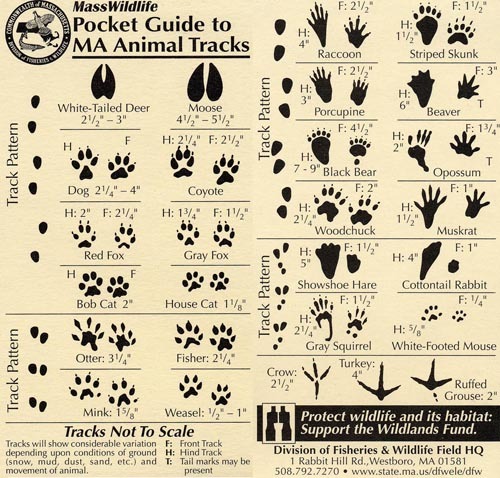 This particular guide comes from the Commonwealth of Massachusetts Division of Wildlife. You can print it out and stick it in your pack-basket for future reference. We all should have a box of these gloves around especially during a disaster aftermath. There are many uses for them, chemical spills, bacteria or diseases and other peoples blood we need not come in contact with under any circumstance. The gloves are cheap and effective. Here are the gloves I use. There are many brands available. I recommend "Nitrile" as it is a very tough material and resists simple blunt punctures. Exam gloves can be necessary in many circumstances, such as during an accident where people are bleeding and need medical attention, caring for and bathing sick people such as family and friends, painting and staining, cleaning high germ count areas, field dressing game or butchering game etc. I also use mine when connecting and disconnecting my RV sewer hose. The gloves are made from several different materials and come in different sizes and colors. The four types of gloves are latex, vinyl, plastic, or nitrile which is synthetic latex that's very durable and slightly more expensive. The type of gloves one uses depends on his or her possible allergy to latex and their personal preference. Some latex gloves are powdered on the inside to make them easy to put on and remove. I don't use powdered gloves and find them easy to put on. Exam gloves typically come in sizes from small to extra large, with extended or smaller sizes available on some models. The size of the glove is determined by measuring the circumference of the widest part of one's hand in inches. Size small accommodates someone with a measurement of 7 to 8 inches. Extra large is for measurements of 10 to 11 inches. The only extra guideline is that, synthetic gloves, such as those made of nitrile, tend to run small. People on the high end of a size range should order nitrile gloves one size up. Gloves come in an array of colors, including blue, green, and pink. The colors available depend upon the type of glove it is and from which manufacturer they are coming from. All drug stores handle them and that is where I buy mine. Or search online, Amazon has many choices.